Over the past years, Provincial Military Command of Nam Dinh has counselled the Provincial Party Committee and the Provincial People’s Committee to effectively carry out the work of defence and security education, thus making contributions to maintaining political security and favourable environment for socio-economic development in the area. Nam Dinh, a coastal province located in Red River Delta region, holds a strategic position in defence posture of the Military Region 3 and the country as a whole. There are three main religions in the area of Nam Dinh Province, namely Buddhism, Christianity and Protestantism. Christian followers account for 22% of the Province’s population; in Nghia Hung district alone, the percentage is 50% and there are communes populated by 100% of Christians. Those are areas potentially abetted by the hostile forces to destabilize political security and social order. Fully aware of that, over the past years, the Provincial Military Command in cooperation with functional agencies has given advice to the Provincial Party Committee and the Provincial People’s Committee to step up the implementation of resolutions, directives and guidance of superiors on defence and security education, with a focus on the 10th Politburo’s Directive 12-CT/TW, dated May 3th 2007, on “Strengthening the Party’s leadership over defence and security education in the new situation”, Law on Defence and Security Education, and other documents and guidance; while strengthening leadership and direction over this work with measures in accordance with local situation. First and foremost, the Province has attached great importance to strengthening structure of Councils for Defence and Security Education at all levels and improving their quality of operation. As the Standing Organ of the Provincial Council for Defence and Security Education, the Provincial Military Command has been active in reviewing, supplementing and completing the structure of the Provincial Council for Defence and Security Education; directed district-level military commands to counsel localities to consolidate the structure of local Councils. Following the plans and guidance of superiors, the Provincial Military Command has counselled the Provincial Council for Defence and Security Education to hold annual conferences on reviewing the work of defence and security education to draw experience and set out guideline and tasks for the following years. To correctly evaluate the quality and efficiency of defence and security education, the Provincial Military Command has given advice to the Province to strengthen inspection of localities and establishments. Annually, the Provincial Council for Defence and Security Education conducts inspection of 1 or 2 districts and 50% of colleges, while directing the district-level councils to inspect 25% of establishments and high schools in their area, thereby timely detecting and rectifying weaknesses in the implementation process. Implementing the Law on Defence and Security Education, the work of improving knowledge of defence and security has been carried out seriously and comprehensively by the Province. Notably, functional organs at all levels have been actively innovated forms of organization and extended groups of cadres in accordance with characteristics of the area and requirements set by Homeland protection in the new situation. Facing the large number of the 2nd group of cadres, the Provincial Military Command has both sent cadres to the Military Region’s training courses and organized training courses right in the Province. Moreover, the Province has focused on training the 3rd group of cadres knowledge of defence and security. The Provincial Military Command has been pro-active in drawing up lists and plans and informing localities about those soon, while promoting role of the Centre for Defence and Security Education under the Military School of Nam Dinh Province in holding courses. 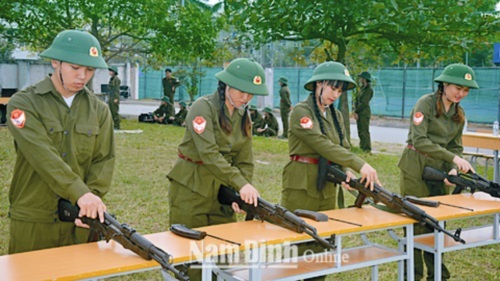 To improve the quality of defence and security education, the Province has assigned cadres with good knowledge and teaching methodology from the Provincial Military Command, Provincial Public Security, Provincial Border Guard Command and Truong Chinh Political College to special topics during the training courses. Between 2011 and 2016, the Province sent 6 cadres of the 1st group to study at the National Defence Academy; organized 5 training courses for 420 cadres of the 2nd group, 21 training courses for 1,935 cadres of the 3rd groups and 2 courses for 245 cadres and officers of the Provincial armed forces. For group of party members, due to the great number, the Province has directed districts to split into groups and organized training courses for complexes of communes. Also, the Provincial Military Command has counselled the Province to combine defence and security education and professional knowledge improvement. Nam Dinh is among the first provinces that have pro-actively extended groups of cadres, which is highly appreciated by the Military Region 3 Command and the Central Council for Defence and Security Education. Promoting the results, the Province has stepped up defence and security education for religious dignitaries. It has directed districts to organize training courses for Buddhist and Catholic dignitaries. Since 2011, it has held 19 training courses on defence and security knowledge for nearly 1,500 dignitaries. Besides, the Provincial Military Command has given advice to the Provincial Party Committee and the Provincial People’s Committee to visit and give gifts and regards to religious dignitaries on occasion of Catholic and Buddhist festivals and ceremonies, and inform them the local situation as well as the Province’s guideline and policy on socio-economic development. Nam Dinh is a coastal province with a huge number of fishing vessels. To help fishermen abide by regulations on fishing and engage in protection of sea and island sovereignty, the Provincial Military Command has directed the Military Command of coastal districts in cooperation with the Provincial Border Guard to hold training courses for vessel owners and captains. After training courses, the Provincial Military Command in collaboration with the Department of Health has given medicine chests and lifebuoy to vessels, thus attracting a lot of participants. What is more, the Province has focused on defence and security education for students. In the Province’s area, there are now 4 universities, 6 colleges and 9 vocational schools. To successfully perform this task, the Provincial Military Command has counselled the Provincial People’s Council and Committee to prioritize investment in building the Centre for Defence and Security Education under the Provincial Military School with good facilities and equipment for training 500 students per course. Since 2015, the Centre has organized 5 training courses for 1,644 students. Moreover, the Provincial Military Command has given advice to the Department of Education and Training and the district-level Councils for Defence and Security Education to hold training courses for more than 20,000 students from 57 high schools in the area. Importance has been attached to the work of disseminating defence and security knowledge to all people by the Province. Promoting its central role in coordination, the Provincial Military Command has worked with the Vietnam Fatherland Front of Nam Dinh, the Mass Mobilization Commission of the Provincial Party Committee, socio-political and humanities organizations to sign coordination documents on conducting propaganda from provincial level to grass-roots level. During annual training courses of committees, sectors and organizations, military organs at levels have combined professional knowledge improvement with dissemination of defence and security knowledge. Moreover, the Political Department (under the Provincial Military Command) and district-level Propaganda and Education Commissions have signed coordination programs on carrying out the ideological and cultural work for committees, sectors, organizations and armed forces of the Province to encourage the participation of the whole political system in propagation and dissemination of defence and security knowledge to the people from all walks of life. The Province has also promoted role of lecturers and propagandists, system of radio and television stations and press agencies at all levels to disseminate the Party’s guideline, the State’s law and policy, local defence and military activities, and fight against distortions of the hostile forces and political opportunists. With efforts of functional organs, the work of defence and security education of Nam Dinh Province has obtained practical results that help raise awareness and responsibility of party committees, authorities, committees, sectors, organizations and people towards defence and security tasks, and make contribution to the cause of Homeland construction and protection.